With the presence of a large pool of participants, the global active pharmaceutical ingredients market is displaying a highly competitive business landscape, finds a new research report by Zion Market Research (ZMR). Novartis International AG, Albemarle Corporation, BASF SE, Boehringer Ingelheim, and Pfizer Inc. are some of the key vendors of active pharmaceutical ingredients across the world. These players across active pharmaceutical ingredients market are focusing aggressively on innovation, as well as on including advanced technologies in their existing products. Over the coming years, they are also expected to take up partnerships and mergers and acquisitions as their key strategy for business development, states the global active pharmaceutical ingredients market study. Citing an instance, in August 2018, Fagron Inc. presented a TrichoConcept™, a first universal line of multifunctional vehicles equipped with patented TrichoTech™ technology, which balances overall hair system including bulb, shaft, and scalp. Reportedly, this line of hair care vehicles was created with a view to provide health care service providers with greater alternatives for delivering various active pharmaceutical ingredients as well as dermaceutical ingredients for effective personalized hair care treatment. 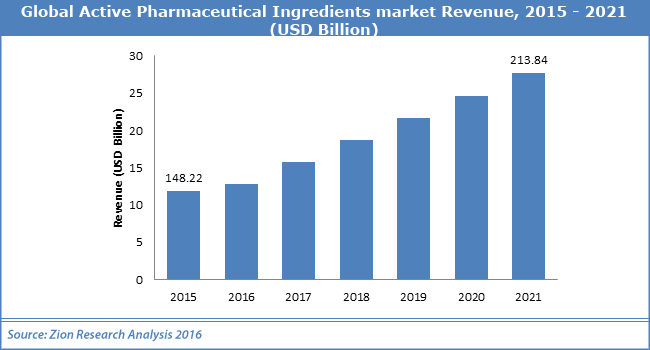 This is likely to favorably influence active pharmaceutical ingredients market revenue in the coming years. As estimated in this report, the global active pharmaceutical ingredients market stood at US$ 148.22 billion in 2015. Witnessing a tremendous rise during the period from 2015 to 2021, the revenue in the active pharmaceutical ingredients market is expected to reach US$ 213.84 billion by the end of the forecast period. The main products available in this active pharmaceutical ingredients market are synthetic active pharmaceutical ingredients and biological active pharmaceutical ingredients. “Growing incidence of chronic & age-related ailments such as diabetes and neurological disorders and technological innovations in API production activities will lucratively impact the expansion of active pharmaceutical ingredients market,” says the author of this study. Apart from this, rise in the API outsourcing activities to low-costs vendors for reducing production & infrastructural costs will further drive the active pharmaceutical ingredients market trends. In addition to this, patent expiry of major generic medicines along with government initiatives is likely to enhance the product popularity over the years to come. Strict legislations regulating the production of active pharmaceutical ingredients, however, is projected to obstruct the growth of active pharmaceutical ingredients market over the coming years. Regionally, North America has been leading the worldwide active pharmaceutical ingredients market and is anticipated to continue on the dominant position in the years to come, states the market study. New technological breakthroughs along with new product developments are the key factor behind the dominance of the North America active pharmaceutical ingredients market. The huge presence of giant pharmaceutical firms in North America is another significant factor lucratively leveraging the growth of North America active pharmaceutical ingredients market.